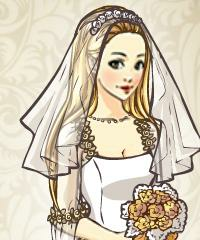 Dress up this beautiful bride in a vintage style. Select the perfect veil, dress and accessories. You can go for a Victorian look, Titanic look or Edwardian look. Or maby Gatsby-style or try out the Art Deco look. What is your favorite vintage style?